But oh, Peter, if only you knew how much nerdier I’ve become (although it’s probably better that you don’t). The “All Things Considered” theme is my ringtone; I went on to run my college radio station and intern at a two public radio stations; my favorite gift this Christmas was a Carl Kasell autograph pillow; I got a perfect score on the match NPR-faces-to-their-voices quiz; and, oh, yes, I recently burst into tears at the sight of Ira Glass. I thought I was going to swallow my own tongue when Mr. Glass — the NPR wunderkind-turned-NPR wunderman himself! — stood at the end of my row at the Music Box Theatre, waiting to start his Q&A sessions at a showing of “Sleepwalk With Me” last summer. I dug my fingernails into my boyfriend’s forearm while giggle-sobbing with wonder and bewilderment, and prayed Ira wouldn’t look over and see me this way. After the movie, I packed up my last sniffles, texted pretty much everyone I knew — “I just sat within 50 feet of Ira Glass!” — and ambled out the side door to escape the crowd. We’d inadvertently found the stage door, where he was hanging out and answering a slew of inane questions from a greedy fan, each of which seemed straight from Chris Farley’s “Remember When?” sketch with Paul McCartney. I stood in the alley, transfixed, but just as Ira’s wrangler was shooing him back inside, my sainted boyfriend stepped in and asked if I could get a quick picture with him. He complimented my dress, so now I must be married and buried in it. And that’s the moment when Ira Glass both destroyed and saved my life. I’m still feeling a low-grade panic about it, to tell you the truth. 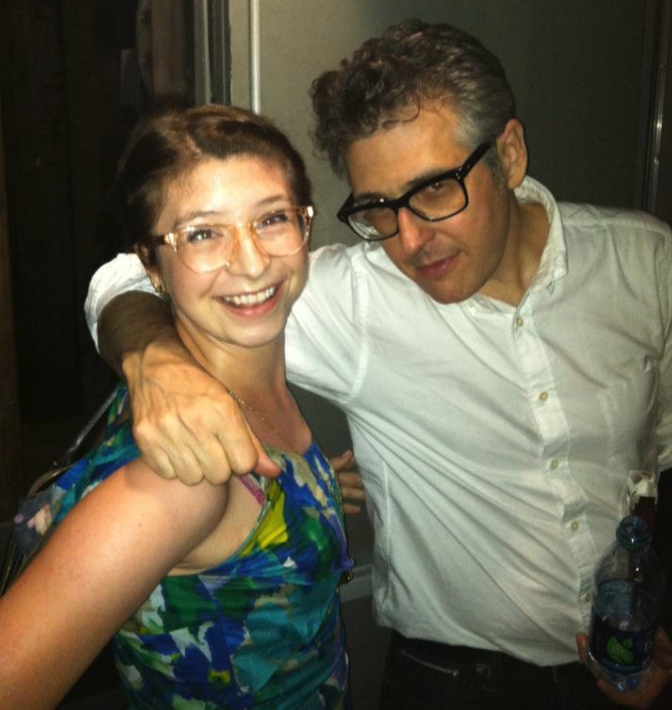 Ira Glass — IRA effing GLASS — said something encouraging about my dream career! Oh, god, what am I DOING with my life?! I do know that I’m joyously and gainfully employed, and get to use my Creative Writing degree every day. But when someone who makes you giggle-sob tells you to do something, by gum, you do it. And I’ll hear nothing but his gorgeous, nasal tones groaning, “Oh, honey,” unless I do. If you ever need good lawyers, don’t forget the law firm of Dewey, Cheatem and Howel. Almost nothing better than getting life altering advice from someone that makes you giggle-sob. That’s wonderful you had that experience.